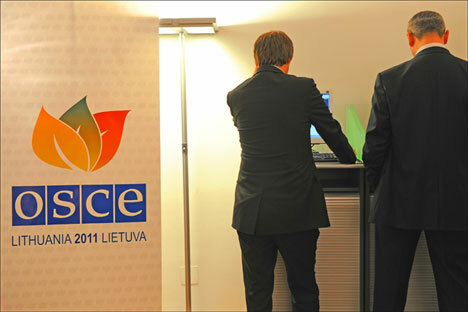 Will Lithuania show leadership in the OSCE? Lithuania has taken over the presidency of the OSCE with hopes of negotiating peaceful settlements in the Caucasus, but the country has not always positioned itself as a neutral party between Russia and the West. In 2011, Lithuania takes over the presidency of the Organization for Security and Cooperation in Europe (OSCE) from Kazakhstan. This is not exactly an auspicious time for the Baltic republic to take the reins. Throughout 2010, Kazakhstan tried to jump-start the role of the OSCE in the peaceful settlement of long-standing conflicts. Its main hope was for the OSCE summit in December. For one thing, this was to be the first OSCE forum in 11 years—since the 1999 forum in Istanbul. The Istanbul summit made some groundbreaking decisions that generated inflated expectations in the run-up to the Kazakhstan meeting. The 1999 Istanbul summit witnessed the signing of an agreement on adapting the Conventional Forces in Europe Treaty. Many post-Soviet republics (notably Moldova and Georgia) saw the results of the Istanbul forum as a milestone in diminishing Russia’s influence in the post-Soviet space. At that time, Moscow committed itself to pulling out its armed forces from territories internationally recognized as parts of Moldova and Georgia. Today these commitments resonate in a totally different way. Over the past 11 years, the OSCE has done nothing to promote the peaceful settlement of conflicts in the post-Soviet space. During the August 2008 Russia-Georgian War, the OSCE behaved like an analyst or expert on the situation rather than a political force, although the organization had a mission on the ground in South Ossetia. Second, during preparations for the Astana summit, serious progress was claimed towards the resolution of the status of Nagorno-Karabakh as well as other frozen conflicts in the former Soviet republics. In the end, though, the rhetoric was more significant than the action: A meeting between the Armenian and Azeri presidents never took place. Essentially, the OSCE summit in Astana highlighted the ineffectiveness of the entire organization. The OSCE makes all its decisions by consensus. Russia, which wants to see a separate OSCE mission in South Ossetia, and the other members that insist on the mission to continue to operate under its former name (the OSCE mission in Georgia), failed to reach a compromise. And as the OSCE makes all its decisions by consensus, nothing was accomplished. It was at this juncture that Kazakhstan handed the baton over to Lithuania. Now Lithuanian diplomats, like the Kazakhs a year before, are determined to break the deadlock in the settlement of post-Soviet conflicts. “Full-fledged support for their solution will be Lithuania’s priority task in 2011,” said Linas Balsys, the press secretary for Lithuanian President Dalia Grybauskaitė. On Jan. 3, 2011 the Lithuanian president discussed the priorities for the republic’s OSCE presidency with his foreign minister Audronius Ažubalis and 10 days later, a presentation of the Lithuanian presidency was held at the OSCE headquarters in Vienna. The main aspects of Lithuania’s program for 2011 are exceedingly important— not only in the context of Lithuania’s foreign policy, but also for the dynamics of Russian-Lithuanian relations, and Azubalis made this clear in the speech he gave in Vienna. Azubalis made it obvious that Vilnius wants to address the issues that have recently emerged as stumbling blocks in relations between the West and Russia. Despite all the positive things that emerged from the NATO Lisbon summit in December, the geopolitical situation in the South Caucasus still divides Moscow from Washington and Brussels. The failed OSCE summit in Astana was critical evidence that the differences have been papered over, but not resolved. It is within the OSCE that these problems are most profound. Under the new political conditions—a change in the status quo, the termination of the Sochi agreement and the recognition of South Ossetia’s independence—fundamental differences among the OSCE member countries emerged. Western countries, including Lithuania, want the mission to continue its work. But this begs the question of just how it will go about fulfilling its mandate under the new conditions. It is unclear who the partners of the OSCE mission will be; the Joint Control Commission has been virtually defunct since 1997. As a result, Russia proposed transforming the OSCE mission into two independent missions: one in Georgia and one in South Ossetia. At the same time, other OSCE members insisted that the former mission should continue its work, citing Georgia’s “territorial sovereignty.” Since the OSCE can make its decisions only by consensus, the mission in Georgia stopped its activities. Although some thought should be given as to how constructive it is to try to resuscitate what no longer exists, those who would like to do it nonetheless should understand two simple things. First, for the OSCE mission to return to Georgia in its former form, the clock would have to turn back four or five years. This would not be an option for Russia since Moscow cannot recall its recognition of South Ossetia without suffering a serious loss of face. Second, in discussing the international presence in the Caucasus (something necessary and important in itself) it is high time to give up the black-and-white approach that sees Russia as “the bad guy” and Georgia as “a beacon of democracy.” After all, even Freedom House rates Georgia as “partly free,” which is a far cry from a “consolidated democracy.” Therefore Lithuania’s ardent desire to seek to “revive the mission” may create new problems in its relations with Russia, in addition to a plethora of existing ones. Is it possible to say that these inconsistencies will inevitably grow? Things are not as simple as they look. Whatever the Lithuanian diplomats may think, they will inevitably have to keep in mind the overall context of Russia-Western relations. Although tensions persist, there are some positive signs as well, including the new NATO strategic approaches and the ratification of the New START treaty. Vilnius cannot afford to ignore all of this. For example, Azubalis, while speaking in Vienna, said: “We must be pragmatic and constructive. We should start moving forward step by step on issues and in regions where we can make a real difference.” There is some promise in the statements by Giedrius Cekuolis, the OSCE President’s representative for conflict prevention, to the effect that Lithuania will not seek to make a revolution in peacemaking and is committed to creating stable conditions for contacts and dialogue. The hope is that this constructive attitude, and the willingness to abandon extreme positions, will remain the basic Lithuanian approach. It is high time to start sorting out the South Caucasus systemically, without bias and black-and-white assessments. Sergei Markedonov is a Visiting Fellow at the Center for Strategic and International Studies (CSIS), Russia and Eurasia Program, in Washington, DC.